Individual investors may face many “known unknowns”—that is to say, things that they know they don’t know. The UK’s referendum on EU membership is one of them, confronting people with a large degree of uncertainty. But it’s not necessary to “make the right call” on the referendum or its consequences to be a successful investor. Our approach is to trust the market to price securities fairly; to take account of broad expectations of future returns. In arguing for the status quo, the “remain” campaign is able to point out familiar characteristics of membership. The “out” campaign, however, is based on intangibles that can only be resolved after the result of the referendum is known. It is impossible for any individual to predict the implications of these unknowns with certainty. But this is no cause for concern. While the referendum is imminent and its implications are potentially vast and unpredictable, it is not necessary for individual investors to make any judgement calls on the outcome. We have faced many uncertainties in the past—general elections, market crises, recessions, wars—and throughout all of them, the market has done its job of aggregating participants’ views about expected returns and priced assets accordingly. 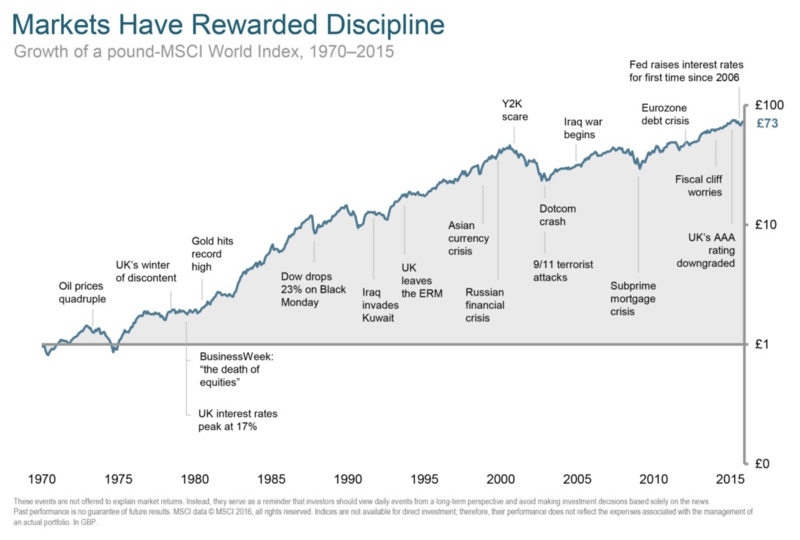 And while these events have caused uncertainty, volatility and short-term losses and gains, none of them has altered the expectation that stocks provide a good long-term return in real terms. We have a global view of investing, and we know that the market is very good at processing information that is relevant to future returns. Because of this view, we don’t attempt to second-guess the market. We manage well-diversified portfolios that do not rely on the outcome of individual events or decisions to target the expected long-term return. These events are not offered to explain market returns. Instead, they serve as a reminder that investors should view daily events from a long-term perspective and avoid making investment decisions based solely on the news. Past performance is no guarantee of future results. MSCI data © MSCI 2016, all rights reserved. Indices are not available for direct investment; therefore, their performance does not reflect the expenses associated with the management of an actual portfolio. In GBP.